The ASPECT-mission is a 3U deep-space CubeSat mission, planned to be sent as a part of the larger Asteroid Impact & Deflection Assessment (AIDA) to the Didymos binary asteroid system. It aims to study the composition and inner structure of the smaller Didymos II asteroid, as well as the effects of space weathering and shock metamorphism on it in order to gain understanding of the formation and evolution of the Solar System. 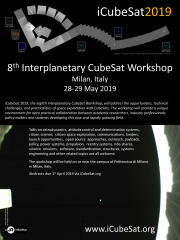 ASPECT will also demonstrate the feasibility of a CubeSat mission in deep-space environment. The AIDA mission in turn comprises of the AIM (ESA) and DART (NASA) spacecraft. One of its goals is to perform an impact experiment on the smaller of the two Didymos asteroids using DART as the impactor, with AIM remaining as an observer. The impactor is expected to make a crater on the surface of the asteroid, bringing up fresh material and exposing better the inner structure. This will also show how well an impacting spacecraft is capable of changing an asteroid’s orbit. ASPECT will be deployed from AIM before the impact, and subsequently will take spectral images for a complete coverage of Didymos II before and after the event. The payload spectral imager will perform measurements in the 500 – 2500 nm range, and will have a better than 2 m spatial resolution of Didymos II. The satellite’s intended orbit is circular with a slight inclination with respect to the Didymos II orbital plane, and outside both Didymos asteroid orbits. Its orbit stability will last only several days, necessitating the use of active orbit maintenance with an onboard propulsion system. The satellite bus will use “commercial-off-the-shelf” avionics, and the main communication link will be through an inter-satellite link with AIM.